Some years ago I wrote to a marketing friend who is big on new "digital technology" even though he still writes books. His ideas on "copyright" are quite loose saying, in effect, that we have to change with the times. On whose terms? His? The public's? He was very big on Wikipedia. I wasn't even though I have used it. I said, "It leaves too much room for incorrect editing and data by slum writers." It turns out to be quite true. Some authors have been caught making up stuff! You know these types, so lacking in self-esteem that their self-esteem (not to mention education and buying their own resources) allows them to rip off others. With respect to chess I have found things that were simply incorrect. If an organization gives you free reign to dump THEIR stuff into Wikipedia, fine. Companies pay a lot of money for their work and research. One such was the Oxford Encyclopedia people when they produced David Hooper's and Ken Whyld's The Oxford Companion to Chess, original AND New edition. I was looking up something about Jackson Whipps Showalter and Pillsbury (H N) to confirm a thought I had about winning the US championship and then defending the title. Well, Wikipedia had the information because it was copied directly from Hooper & Whyld's book (I was double checking)! Directly. No paraphrasing, no parsing, no mention (except under references [and that doesn't given them a license to "lift"]). This is wrong. The defense is ALWAYS lame. "We (Wikipedia Users) don't have access to H&W's book, it costs too much since it is out of print." This idiotic comment makes it sound as if they would ACTUALLY buy the book if it was available. How many of us believe that? It is this casual theft which makes many publishers give up on publishing researched reference books. I doubt if it can be stopped--few with deep pockets are willing to attempt it except perhaps Viacom on YouTube. When paper publishers cease will "online publishers" be willing to publish it for free? My guess? No. Who will take the first step? There is one guy out there who rips off ChessBase DVDs; you can see him and hear his blather at tournaments around the country. DO NOT buy any of this stuff from him! He will give you all kinds of BS arguments about what he is doing as being all right. It isn't. ChessBase knows who he is but is unwilling to send people after him and put him in jail. One reason? He has no verifiable address since he is on the move all the time. Well, not true. Go to some tournaments, especially in the Midwest. You will find him. Some years ago, in Sioux Falls, SD I confronted him directly. After he tried to shove all of his crap down my gullet I told him he was a crook and a liar. Guess what? His response was to call me filthy names and walk away. Doesn't this sound like a person on the up and up? I didn't back down, he did. But everyone else backs down. ChessBase has the money, they just don't want to spend it. I estimate he costs them hundreds of thousands of dollars a year. No, that's not what HE makes, he discounts everything--it is what ChessBase would get paid if they got all their "rightful" money (of course I realize people buy stuff from this jerk because it IS offered at a huge discount--or on a mini hard drive with everything on it!). Would you support this guy? I hope not. 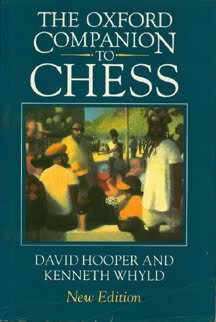 Over the years I have kept my share of chess reference books which I originally bought. I have done my own research and writing. For example, in the fantastic Purdy Chess Chronicles which I work on, I USE the books and magazines themselves WITH paid-for permission from the Purdy family! That's what I call BEING SERIOUS.